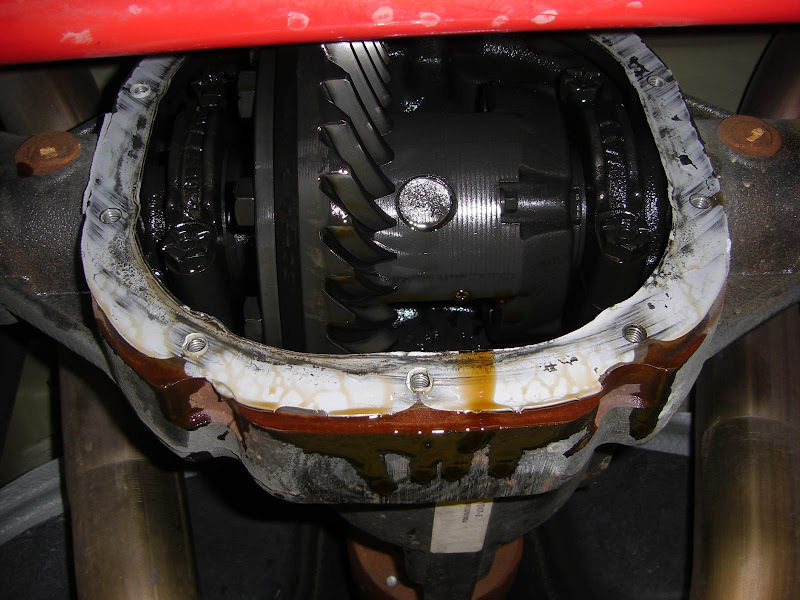 There are two ways to change it...use a hand suction pump (easier) or remove the differential cover (slightly more involved). I chose to remove the cover. 1. Raise the car and support it securly on jackstands. 2. 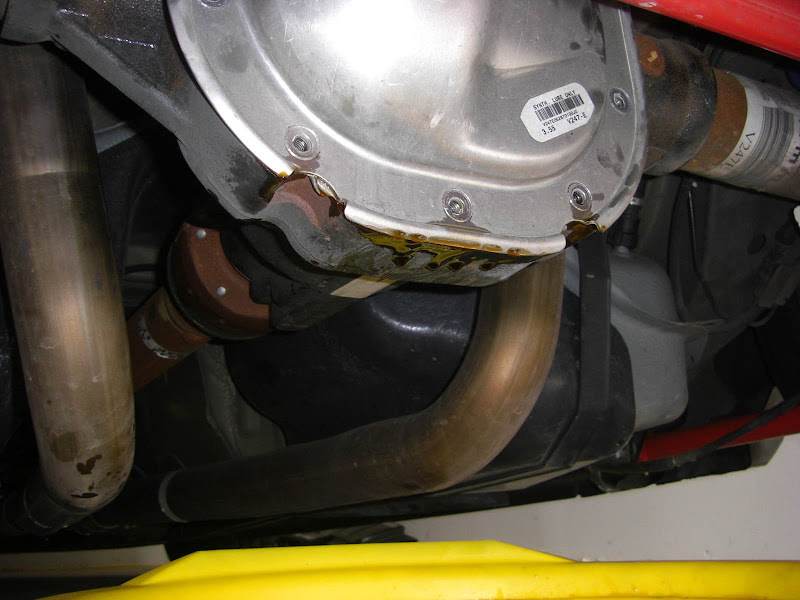 Move the drain pan under the differential, keeping shop rags close by. 3. 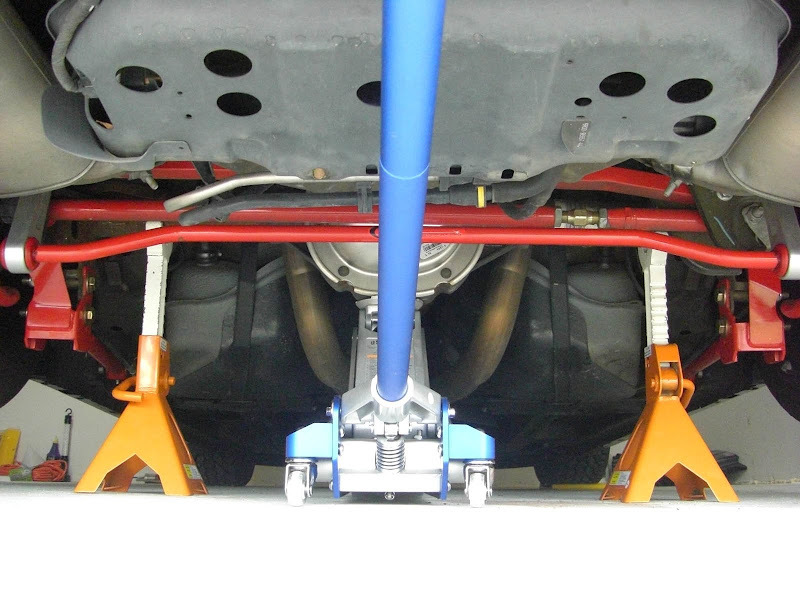 Using the 3/8" male socket extension, remove the fill plug from the front driver's side of the differential. 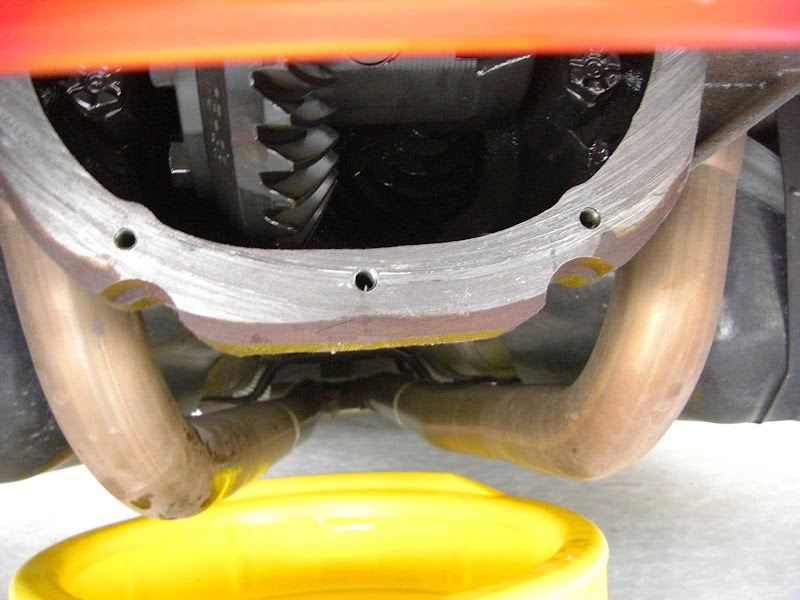 As you loosen the plug you will hear air going inside the differential housing. Once you have removed the plug you will probably see small metal shaving attached to the back of it. The plug is actually magnetic to attract any metal debris and keep it from interrupting the gears movement. 4. 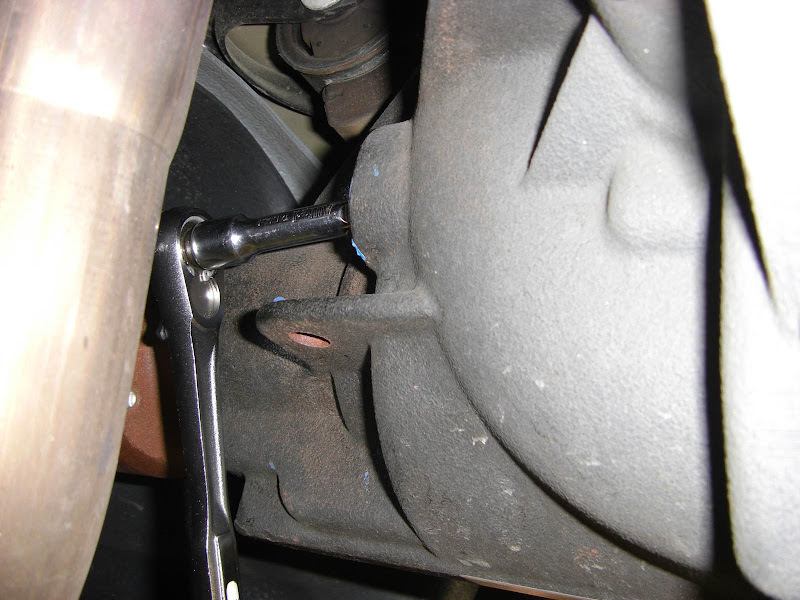 Using a 1/2" ratcheting wrech, remove the majority of bolts on the differential cover while leaving the top bolt in place but loose. 5. Pry the cover away from the mating surface with a flathead screwdriver carefully so not to bend the cover. 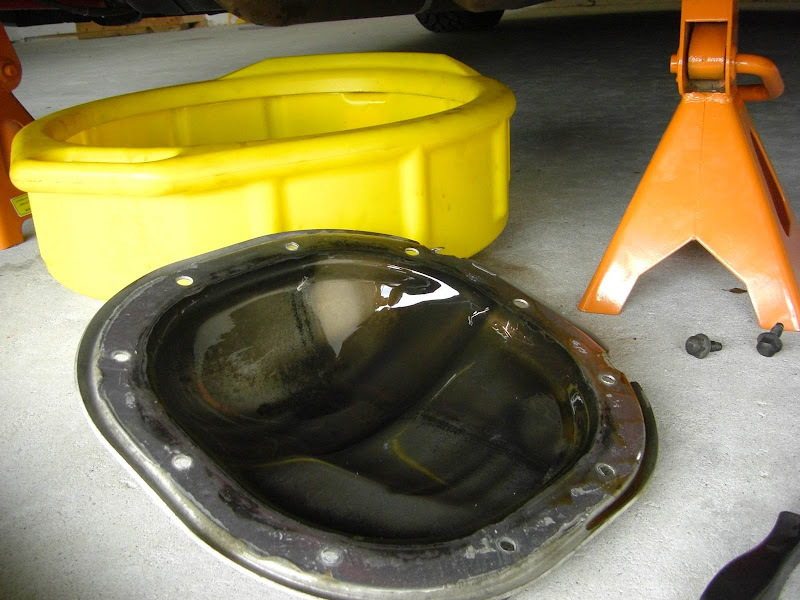 The fluid should begin draining out into your drain pan below. 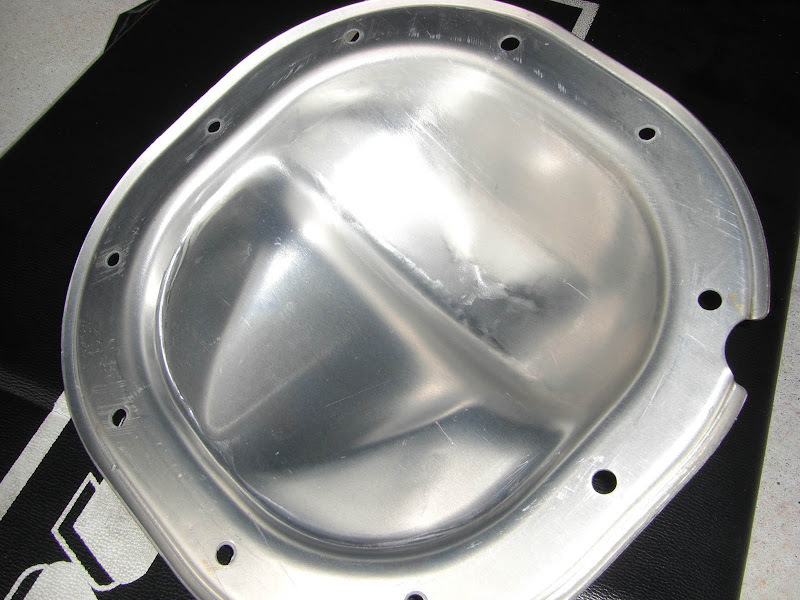 Once the fluid is almost completely drained, you can remove the last bolt at the top holding the cover in place. 7. 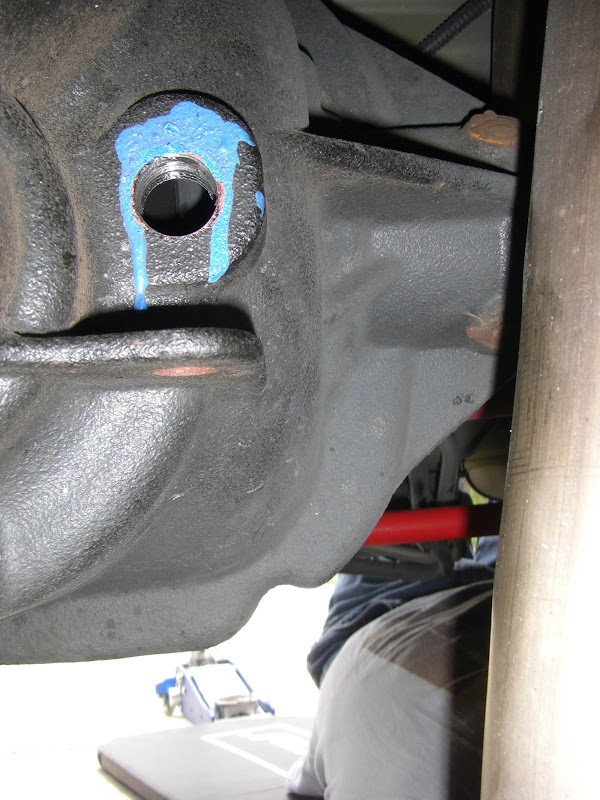 Use a lint-free rag to clean the inside of the cover and easily reached areas inside the differential housing. 8. 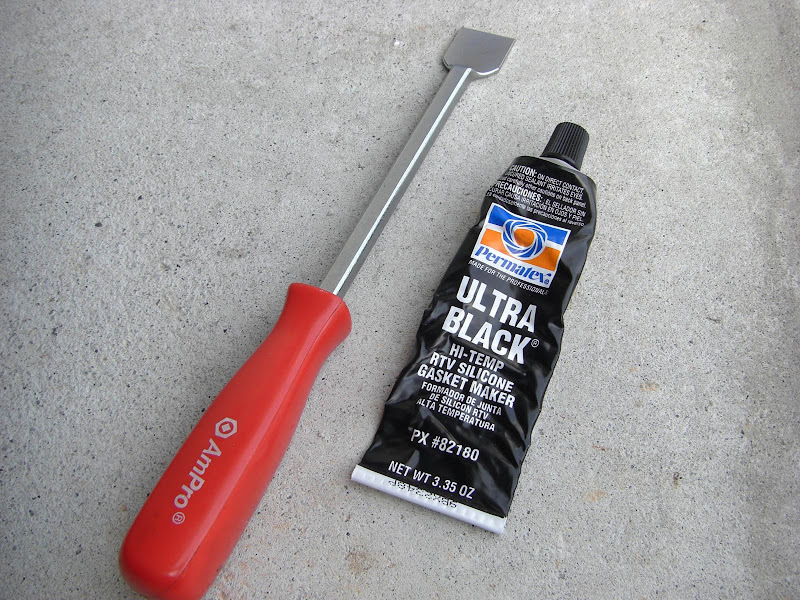 Scrape off the old mating gasket with a gasket scraper or putty knife making sure the surface is free of any old gasket material. 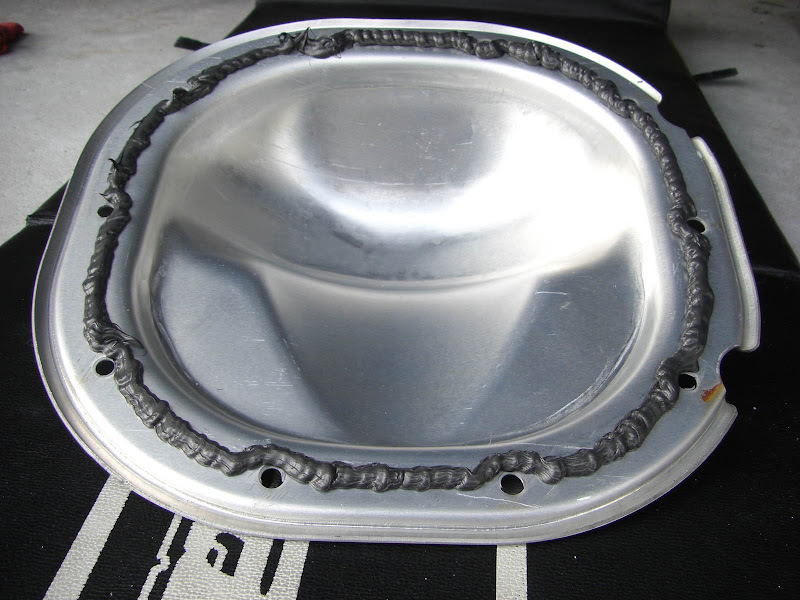 After removing the old gasket, the mating surface should be clean and dry. 9. 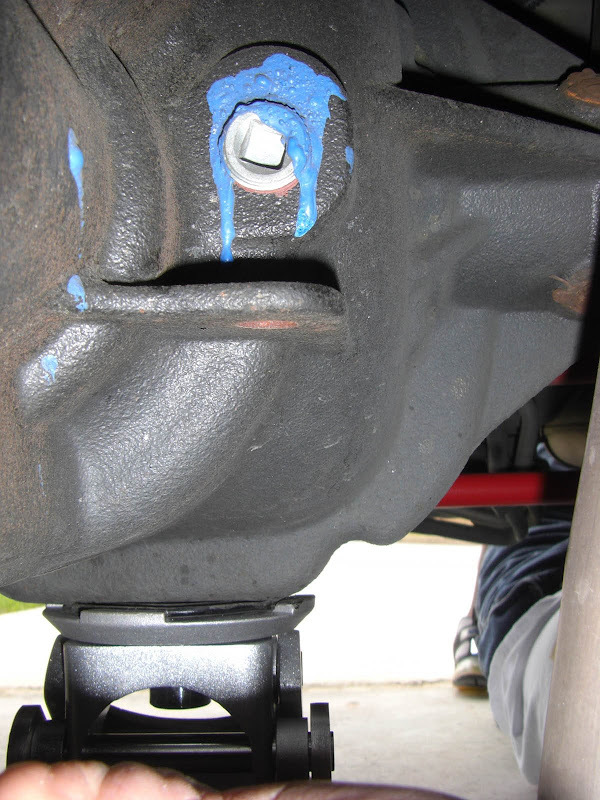 Apply approxiametly a 1/8" bead of Hi-Temp RTV Gasket Maker (I used Permatex Ultra Black) to the cover, routing the bead on the inside of the bolt holes. 11. 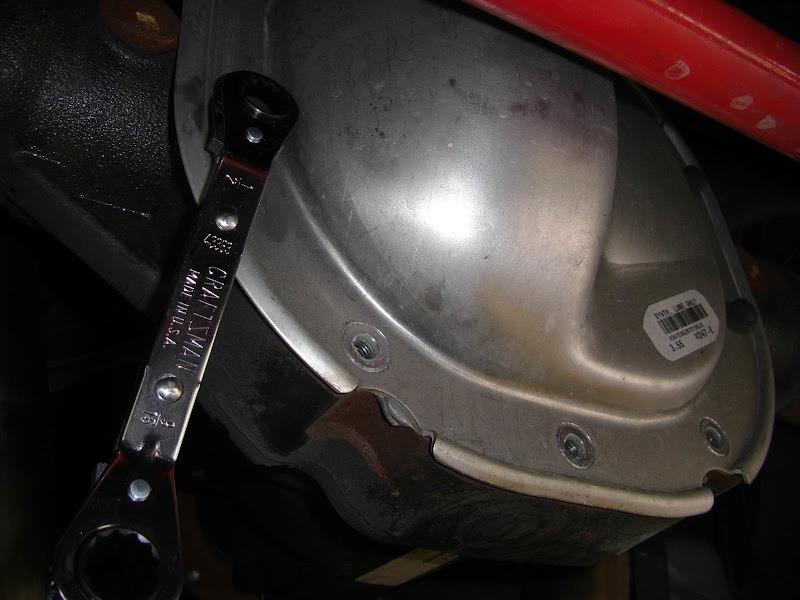 Allow gasket to dry for 1 hour then tighten all bolts to 33 ft./lbs in a X pattern using the 1/2" ratcheting wrench. 12. Fill the differential housing with a 4oz. 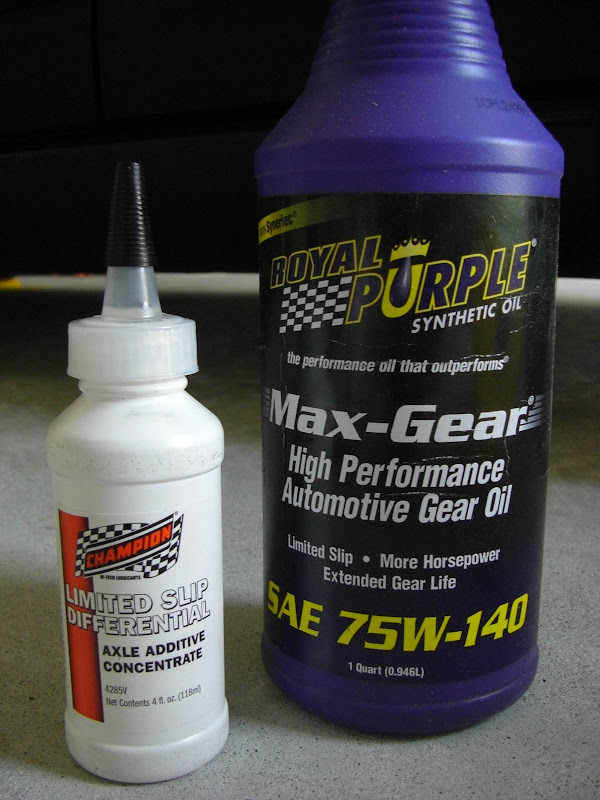 bottle of Additive Friction Modifier (I used Champion Axle Additive Concentrate) and fill the rest with High Performance Synthetic 75W-140 Gear Oil (I used Royal Purple Max-Gear) until the fluid is level with the bottom of the fill hole. 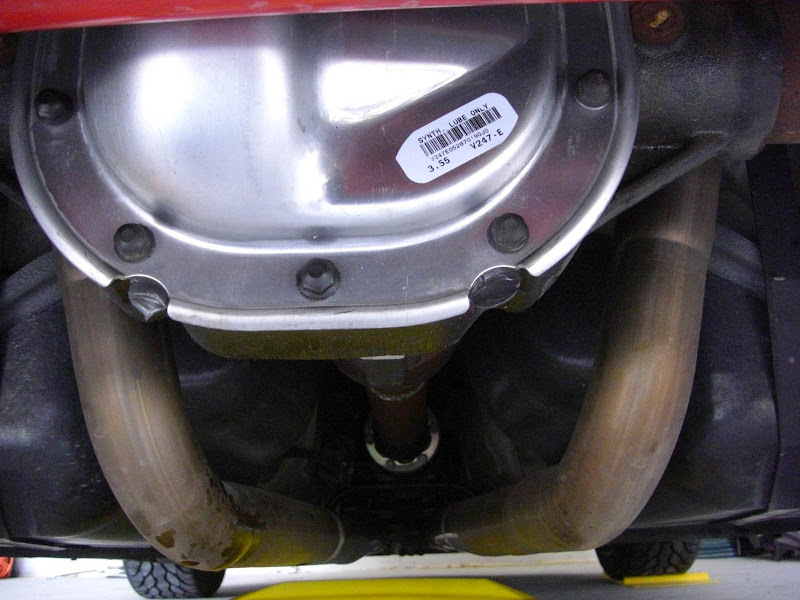 Note: A V6(7.5" axle) has a capacity of approxiametly 1.5 liters while a V8 (8.8" axle) requires about 2.0 liters. I ended up using about 2.5 liters after the additive to get it to the bottom of the fill plug. 13. Install and tighten the fill plug. Note: A representative from Royal Purple told me that I may notice a faint noise from the differential for a few days until the new fluid and additive impregnate the clutch pads. Yeah, I guess someone could have spent $175 for an aftermarket cover with a drain plug but that someone wasn't going to be me . It would make changing it easier next time but how many times you plan on changing it . Aftermarket covers do look cool though. I need a new cover mine is damaged.